Prizes must be redeemed by FEB 5th, 2014. I won a iPod Shuffle. I love entering these contests. I always find new authors to read when doing these contests. On Jan 18, 2014, Kareninnc said: Winners? I couldn't attend the chat on Friday 1/18 so I don't know who the winners of this contest are. Will they be posted someplace on the website? Regan Black, Susan Arden, Jennifer Faye, Jessica Jayne, Lily Santana, Nancy Adams, Ophelia London, Robin Bielman, and Roz Lee. On Jan 16, 2014, Gwendy said: Again, so many!!! Okay so I know I say this every time, but it really is hard to choose! Since it worked so well for me last time, I will use the ever intellectual closing my eyes and pointing to the TBR list that I made from this. And drum roll....Golden Anidae by Suzanne Sabol. Sounds really good. That Pearly Drop by Jianne Carlo and Obsession by Sharon Buchbinder. This is my must read from the Hunt. I'm in the mood for a time-travel romance! A must read is Jean' Murray's Soul Reborn. Looking forward to ordering (or winning!) this soon. A Must Read I found was The Pearly Drop by Jianne Carlo. I have found some amazing sounding books and have added them to my TBR! Ruth A. Casie's The Guardian's Witch, Nancy Adams's The Bannockburn Spell and Defiant Surrender by Tamara Gill. Thank you for the introduction to these new to me authors! Logan's Acadian Wolves would be my must read. Silver James' Season of the Witch. In The Blood by Sara Hantz has been added to my ever-growing to be read list. On Jan 13, 2014, lisagk said: Favorite? I agree with several others that picking a favorite is difficult, I would like to read Her Accidental Boyfriend and also An Unbridled Cowboy among several others. Thank you. Silver James' Season of the Witch is a must read to me. I chose Lorhainne Eckhart. She is a new author to me. I haven't read any of her books. I picked up Volume 1 & 2 of Finding Love-The Outsiders series. I liked the storyline of all the books in the series. They intrigued me. I'm looking forward to read the entire series soon...Yeah, the long TBR list....sigh! I'll get there. I loved reading Verna Clay Christmas Kisses during the holidays! And nothing is better than a good read from author Jianne Carlo..That Pearly Drop. On Jan 10, 2014, Orangepeacock said: The hunt! I found Peggy Bird's Believing Again to be a very Intriguing book. The characters sound awesome and I'd love the chance to read this one! Thanks so much for continuing to post these types of events! I love the hunts so much! And thanks so much for the chance to win! There are quite a few titles that look quite intriguing, including Forewarning by Kate Wyland and Unlikely Angel by Genie Gabriel. Thanks to all of the authors for the wonderful giveaways! I wanted to read Obsession by Sharon Buchbinder when I first read a blurb about it, but then I lost the piece of paper on which the name was written. I am so glad it is part of this contest. I also want to read Bulletproof by Regan Black. Thank you to all the authors for the prizes and to Night Owl Reviews for putting this all together. I want to read Golden Anidae by Suzanne M. Sabol and The Guardian's Witch by Ruth A. Casie. Season of the Witch by Silver James is a must read for me. Thanks for the great giveaway! I MUST read Coldheart by Justin Robinson. The combination of mystery, thriller, and a touch of horror is simply too good to resist. On Jan 08, 2014, Diana Coyle said: Can't wait to read! I just can't wait to read: Her Accidental Boyfriend by Robin Bielman. On Jan 08, 2014, DrRob said: Winter Wonderland Must Reads! Really? it's impossible to pick just one. Definite reads for me are "Sleight of Heart" as Historical Western Romance is my all time favorite genre, and "Her Unbridled Cowboy" because I live vicariously through every heroine in a Cowboy novel...six pack abs, tight jeans, what's not to love! On Jan 07, 2014, Tara W said: Paranormal Lover! A new must read for me is Wolf's Haven (Caedmon Wolves, #1) by Ambrielle Kirk. I've read excerpts of Solace in Scandal and it's on my list of books to read. It's hard to pick from this great list of books but I would also like to read Board Stiff and Logan's Acadian Wolves, just to name a few more. On Jan 07, 2014, MelCamino said: Must read! I found so many new to me authors as well as revisited others. I really want to read Scarlett Scott's Win My Love. Definitely Maybe in Love. 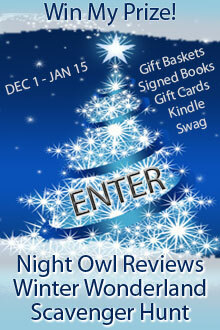 Thanks to the authors and Night Owl reviews for the amazing contest. Really liking Sabrina York's Heart of Ash & Kym Grosso's Logan's Acadian Wolves! Outback Affair by Annie Seaton is a must read that I found. There were so many that I already added to my list, but the one that I absolutely must read is Bullet Proof by Regan Black. I have read a couple of her books and I absolutely love her!! I will be getting this book and starting it pronto. Thanks for the fun scavenger hunt again. I love these. I find so many new books and authors I have never read but now want to. "Unlikely Angel" by Genie Gabriel. This looks like an amazing book. There were so many and I can't wait to add a bunch to my to buy list. Thank you so much for the awesome giveaway! I hope you are having an amazing 2014 so far. I have found several I would like to read. They are: Her Unbridled Cowboy; That Pearly Drop; Daddy Morebucks; Mrs. Roth's Merry Christmas; and Board Stiff. So many books I want to read. Soul Chase by Anne Hope, Forewarning by Kate Wyland and The Guardian's Witch by Ruth A. Casie sound very good to me! I am looking forward to reading this book , I am all about the Alpha wolves love them. Bulletproof by Reagan Black looks interesting to me. I want to read Cassie's Hope and Her unbridled cowboy. They look so good!! I am suggesting, for myself and for all, the following books: Venice in the Moonlight by Elizabeth McKenna and Snowbound With The Soldier by Jennifer Faye. There are a lot of great-sounding books on here. To choose just one, I'd have to say 'Double Vision' by Regan Black stands out to me as a must read. Season of the witch is one I would like to read! My must read book is Defiant Surrender by Tamara Gill. On Dec 28, 2013, Arianne said: A Must read book from this contest? A Must read book from this contest is "Mrs. Roth's Merry Christmas" by Holley Trent; it sounds like a great funny romance that I have to get my hands on soon. On Dec 26, 2013, Shadow said: Winter Wonderland! Oh! There are so many good books featured! There are two tho that im dying to read. Because This Is Forever by Lena Hart and Wolf's Haven by Ambrielle Kirk. I love wolf shifters! There so captivating! Both books look awesome! Now I want to read Bulletproof by Regan Black! Annie Seaton's Outback Affair is the book that interests me most at present. Sleight of Heart Looks amazing!!! On Dec 20, 2013, helenetienda said: Lot's of good one's! I really want to read Christmas Kisses. I'D LOVE TO REVIEW bULLETPROOF! Always glad to see a new title from Kimberly Dean! I found three books to put on my tbr list. Caryn Moya Block- A Siberian werewolf Christmas, Billi Jean- Sorcha's Wolf, and Kim Grosso- Logan's Acadian Wolves. I've added That Pearly Drop by Jianne Carlo to my read list. On Dec 15, 2013, LadyVampire said: So Many New Books to Wishlist! I found so many great new authors and books to wish list. Two of my top picks are "A Siberian Werewolf Christmas" by Caryn Moya Block and "Unlikely Angel" by Genie Gabriel. Thank you for the amazing giveaway! Happy Holidays to one and all. On Dec 14, 2013, Sylvie said: Awesome Contest! Thanks so much for this great contest! I love all things paranormal, so I'm especially looking forward to reading Sorcha's Wolf by Billi Jean and Cursed by Lynn Ricci. On Dec 11, 2013, Angieia said: The Pearly Drop sounds interesting! The Pearly Drop by Jianne Carlo looks interesting. I have already read Obsession by Sharon Buchbinder and it was really good. On Dec 11, 2013, atiffyfit said: I pinned! On Dec 11, 2013, atiffyfit said: I facebooked! On Dec 11, 2013, atiffyfit said: I tweeted! On Dec 11, 2013, atiffyfit said: wowza! thank you to all the authors for all the generous prizes! on my must read list are definitely maybe in love and season of the witch. On Dec 10, 2013, Ashley E said: Must Read! Coldheart by Justin Robinson sounds amazing! Adding it to my TBR list. 1. I would like to read Win my Love by Scarlett Scott. Definite Traci Douglass and Seal Series, for me.Sleight of Hand is an interesting read by Jacquie Rogers. Jianne Carlo That Pearly Drop is a great time-travel story! suzyrph@charter.net. The Bannockburn Spell by Nancy Adams and Mrs. Roth's Merry Christmas by Holley Trent. On Dec 08, 2013, Angellicia said: Must Read!! I'm dying to read Cassie's Hope by Adriana Kraft!! On Dec 08, 2013, BookAttict said: My TBR List blew up! Happy Holidays and thanks for another amazing giveaway! Her Unbridled Cowboy, Heart of Ash, Obsession, Season of the Witch, so many more to choose from. Once again, Santa needs to gift me books. On Dec 06, 2013, Sherry said: Book I want! I really want to read Switch Hitter by Roz Lee. It sounds great. On Dec 06, 2013, TrinaC said: My picks! I found a bunch that I want to read & some new authors to check out too! On Dec 06, 2013, princesslissa said: MUST READ! I've added Switch Hitter by Roz Lee to my must read list. On Dec 06, 2013, Cheryl said: My pick! Robin Bielman's Her Accidental Boyfriend sounds great and the cover draws me in! Really interested in reading Daddy Morebucks by Normandie Alleman, Switch Hitter by Roz Lee, and Saving Alexander by Susan Mac Nicol. You have to read this! It is awesome! Heart of Ash by Sabrina York! I didn't just find one story to add to my must have and I even found new authors to check out. Season of the Witch by Silver James looks right up my alley. I just have to read Logan's Acadian Wolves by Kym Grosso. Seal of Awakening by Traci Douglass is a must-read for me. I love paranormal time travel and all the fun that implies. My must read is definitely Her Unbridled Cowboy by Donna Michaels. I love anything with a hot cowboy. On Dec 03, 2013, rosered said: Must read! My must read is LOGAN'S "ACADIAN WOLVES" by KYM GROSSO. My must read is Defiant Surrender by Tamara Gill. My must read from the hunt is Brave by Zoe Dawson. Lots of other books on the must read list . As always loved the hunt and all the new reads. Pinned and followed on Pinterest. On Dec 03, 2013, Hitherandthee said: Must read! The Guardian's Witch and That Pearly Drop are both terrific books....I'm reading both of them now, and will be rereading them many times to come!! Love them both! So many "new to me" authors I've found a bunch of books to add to my TBR shelf but I think my favorite is Definitely, Maybe in Love - Ophelia London. Crash & Burn by Susan Arden sounds fantastic! On Dec 01, 2013, KainsHottie said: Thanks! I read Elizabeth Mckenna's Cera Place and loved it. REally looking forward to reading her second book - Venice in the Moonlight. As for a new author - definately checking out Genie Gabriel's Unlikely Angel for Christmas. This book by Bethany Michaels proves that revenge does not always go the way you plan. It was good. I think "War of Hearts" by Lynn Hubbard is a must read. On Dec 01, 2013, mrscrabbyfan said: Winter Wonderland 2013 comment. Thank you for the great chance I found a lot of new authors and a lot of books I will be reading I think the one I want to read the most would be Logan's Acadian by Kym Grosso Thank you to all the authors for making this possible with you generosity. I really hope I did this right. On Dec 01, 2013, msdebms said: Attention! Defiant Surrender by Tamara Gill looks great. I love a good time travel romance. Add the words, "defiant" and "surrender" and you have my full attention. So I now really want to read A Siberian Werewolf Christmas - Siberian Volkov Series, #6 by Caryn Moya Block! Thanks for the hunt and to all the authors participating! Kym Grosso - Logan's Acadian Wolves!! Love the cover. This series sounds wonderful. I hadn't heard about the author before. Sleight of Hand by Jacquie Rogers sounds like a great read. I agree that the Siberian Werewolf Christmas by Caryn Moya Block, so does Kym Grosso - Logan's Acadian Wolves. Caryn Moya Block - A Siberian Werewolf Christmas. Sounds like a good book! Lynn Ricci - Cursed - sounds like a good book. Lena Hart - Because This is Forever! Read, read, read! I have 4 must reads that I found doing this contest. Medium Rare - Meg Benjamin! On Nov 21, 2013, MelodyReads said: Wow!